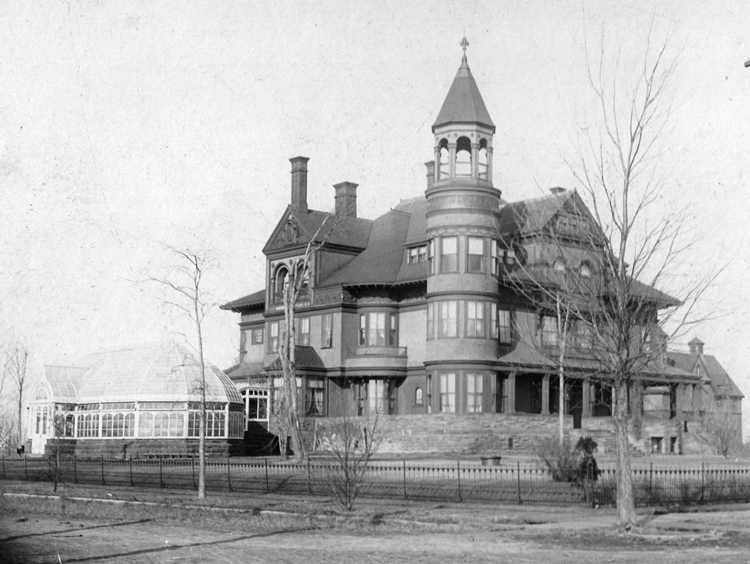 Superior’s Fairlawn Mansion was built in 1890 as the home of industrialist Martin Pattison and his family. Overlooking the bayfront, it stands as an example of the opulent lifestyle led by the nouveau riché during America’s Gilded Age. The mansion also serves as an enduring reminder of the generous philanthropy of Pattison and his wife, Grace. During the 1890s, Superior’s population rapidly increased from fewer than 12,000 in 1890 to more than 31,000 by 1900. A transportation hub positioned at the western-most port on the Great Lakes, Superior was riding high on a wave of national expansion. Speculators dubbed it “Little Chicago.” Adventurous men made their fortunes in lumbering and mineral mining, and in shipping goods, agricultural crops, and minerals by land and sea. Pattison was one such man, making his fortune as a lumberman and mining speculator. He became a greatly admired and well-respected civic leader in Superior, despite hiding a scandal from his past that would have ruined other men. In 1889 Pattison announced plans to construct a grand home befitting a man of his position; he wanted to establish evidence of his wealth and make his home a model for self-made men such as himself. He purchased a full city block along what is now East Second Street, with an unobstructed view of Superior Bay and the open water of Lake Superior beyond Minnesota Point. There he would build a mansion that includes elements of both the Queen Anne Victorian style and the French Château-esque style of architecture. 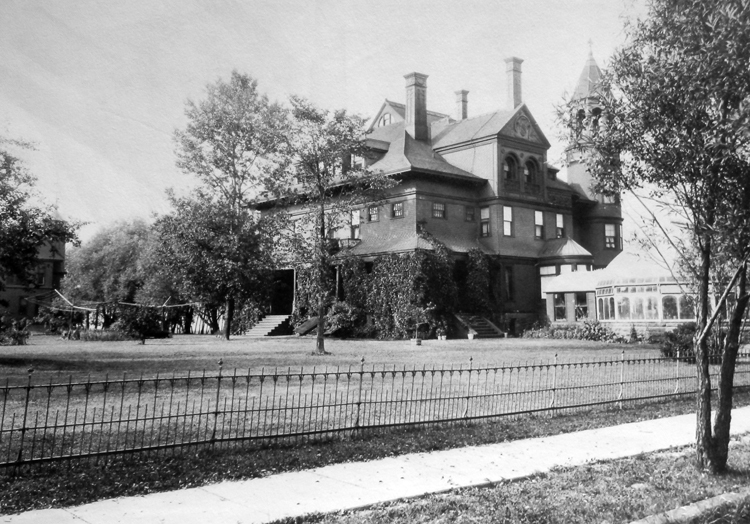 While the house’s architect has not been identified (no blueprints have been found, and city documents do not include an architect’s name), it is widely speculated that the house was designed by John DeWaard, a popular architect working in both Superior and Duluth in the 1890s. DeWaard is known to have designed some of the decorative woodwork found in Fairlawn’s interior rooms and may well have drawn up plans for the entire house. Construction was completed by fall 1891. According to Tom Davis, author of Fairlawn: Restoring the Splendor, Fairlawn’s exterior is typical to the Queen Anne style, built with contrasting shapes, textures, and colors. The house stands three stories above a block foundation of Lake Superior brownstone, capped with a roof that includes gables on all four sides. Grooved wooden columns topped with Corinthian capitals support the porch roof, which spans the entire front of the house and wraps around to the carriage entrance, or porte-cochère, at the north side of the house. “Fish scale” cedar shakes cover the majority of the second and third floors, giving the mansion the “gingerbread” look characteristic of Victorian-era architecture. Graceful curved brackets support second-floor overhangs and a copper frieze with a rich green patina runs along the roof cornice. Tucked in the upper-most peak of the front gable, a copper relief plate bears the year 1890, though the main house was not completed until the following year and the conservatory wouldn’t be added until 1895. A four-story round tower—capped with a high-peaked roof over an octagonal turret—stands at the house’s southeast corner, offering a bird’s-eye view of the lake and the Duluth hillside. The original exterior color choice was a conservative pallet, especially in light of the trend for the more vivid, contrasting-color schemes popular for Victorian “painted ladies.” Pattison chose complimentary hues in subdued browns ranging from a warm reddish shade to light gingery tints. The brighter salmon pink ceiling of the porch was the only exception—and perhaps a nod to the trends of the time. Inside, the 42-room structure was the grandest home Superior had ever seen. The main entrance opened to a long hallway with rooms to either side. At the time, hallways were often considered wasted space, but Fairlawn’s first-floor hallway is both remarkably long and wide. It is punctuated by the main landing of the elegant oak staircase that leads to the second floor—a landing that is a room unto itself, complete with fireplace. The remainder of the main floor includes a reception room, parlor, music room, formal dining room, butler’s pantry, kitchen, and Pattison’s library and office. Other amenities included at the time it was built were indoor plumbing with hot-and-cold running water, nine gas fireplaces, steam heat, an electric dumbwaiter, a central vacuum system, and an air shaft in the center of the home through which a fan circulated air throughout the entire house. Pattison even had skylights installed in the attic roof. If that wasn’t enough, the basement contained a bowling alley and plunge pool, and the third floor both a billiard room and ballroom. The wide friezes and ceilings of the first-floor rooms are adorned with hand-painted murals. Woodwork throughout the mansion is made of quarter-sawn oak, Guatemalan mahogany, hand-carved bird’s-eye maple, and white lacquered birch trimmed in gold leaf. When fully complete, the estate also included a carriage house and a conservatory. The conservatory was designed by architect John Chisholm and connected to the main house via a 14×16-foot potting house. The oval-shaped glass and steel dome measured 25×50-feet and rose 15-feet from its sandstone foundation—the same stone used in the mansion’s foundation. The stone came from the Acadia Quarry near Amnicon Falls, not far from Superior. Acadia was owned by James Bardon, a Superior pioneer for whom Duluth’s Bardon’s Peak is named. The cost to build the estate was recorded at more than $150,000—nearly $4 million in today’s dollars. However, a family history written in the late 1920s notes that the total cost of the mansion—including all furnishings and mechanical equipment—came to over $250,000, closer to $6.5 million today. While the story behind the name is unknown, by 1895 the house had become known as Fairlawn. Martin and Grace Pattison had four children when they moved into their palatial home in the fall of 1891: Martha, Byron, Ethel, and Alice. Twins Myrna and Vyrna were born in 1892, followed by Lois and Leda, another set of twin girls born in 1893. Vyrna and Leda both died in infancy. The Pattisons employed a large staff at Fairlawn, including housekeepers, kitchen help, and liverymen. They reportedly treated their staff well, with the same kindness and generosity for which they were known throughout the community. Staff quarters were provided on the mansion’s third floor and above the carriage house. Fairlawn never looked so beautiful as when its spacious apartments were decked with flowers and foliage arranged for this evening’s event. Ferns and many rare plants from the conservatory filled the many niches and corners, while an exquisite bunch of Jacqueminot roses stood upon the hall table. The parlor is decorated with pink and white roses and smilax in festoons over the mantle, the music room with white and yellow flowers, while the reception room and library beyond present a most effective picture with American beauties and other beautiful flowers amidst the green foliage of potted plants. Martin Pattison died in 1918 at the age of 77; Grace was 62 years old. She and her youngest daughter, Lois, remained in the mansion until 1920 when they moved to Los Angeles seeking a climate that would ease the symptoms of Lois’s rheumatoid arthritis. A woman of considerable wealth, Grace built a Tudor-style mansion called “Windsor” on 37 acres and lived there until her death in 1934. Lois, her husband, and their son continued to live at Windsor after Grace’s passing.